There is one thing I have well and truly absorbed from the British - their obsession with the weather. There is a very simple reason why Brits are obsessed with the weather. It rains. A lot. This rain goes hand in hand with grey skies, wet hair, damp clothes and general misery. Let's put it like this: If you lived in Mordor, the land of shadow, you probably would turn into Sauron. On this particular topic, I have declared a social media moratorium. There is nothing more irritating than endless messages on #BritishSummer. Particularly if you live in a part of the world where rain would bring a much welcome respite from blazing sunshine. You lucky bastards... So I've been huffing and puffing offline. Refusing to accept defeat to the weather gods. Even steaming ahead with barbeques in the midst of near tropical thunderstorms. Like the one we had last weekend. With Chicken Shashliks, Lamb Chops, Pork Vindaloo steaks, pouring rain and a soaking wet barbeque. The man stood indoors with the door slightly ajar, weilding a stick attached to a tool. Our friend ran outside with a giant brolly hoisting the barbeque cover off so the man could prod and flip the kebabs over. I poured the bubbly and Pimms. We may not have great weather, but you can't fault our sense of humour. The crowning glory was most certainly the rich and creamy all weatherMango Kulfi that came later. This is an all weather mango ice cream recipe mainly because it doesn't need real mangoes at all. If you find one out of season, that has defied all eco-logic to rack up some serious air miles, you could chop it up for decoration. But if not, whizz this up when mangoes are no where in sight. Or warm and sunny weather for that matter. Grind the cardamoms into powder using a pestle and mortar or spice grinder. I use the latter. In a large beaker, measure and pour in the mango pulp, double cream and condensed milk. Tip in the cardamom powder and whisk the mixture together fast until it is of a uniform colour and bubbles appear. This should take 2 minutes. Now line the cups up and pour the mixture into each, until two inches deep. Wipe up any spillages and then freeze in a single row. Pur any remaining mango pulp into the same beaker, whisk well and leave to sit in the fridge. After two hours, take the semi frozen kulfis out three at a time and give them a good stir with a metal spoon. This prevents the kulfis from being frosty later. Then top them with a tablespoon of the remaining pulp and leave to set in the freezer for another two hours. As I was feeding 15, I served each in the cup itself with a little serving of diced mango on top. They are rock hard when out of the freezer so give them a minute before you hand them out with spoons. With the two that were remaining to photograph, I warmed the kulfis in the palm of my hand before tipping them out on to plates and decorating with mango. I have to go out and find some mango pulp so I can make these. Mangoes are the best. Folks, mango pulp is readily available at big supermarkets, specialist grocery stores and online (even on Amazon)… go go go! Wonderful!!!! Thank you for this idea. It is so blasted hot and drought-ridden where I am kulfi sounds like heaven. Am going out now to buy paper cups! Kulfi is one of my favourites…it looks even more delicious in your pics. I’ve got a couple of fresh mangoes so will give it a try. Amazing! 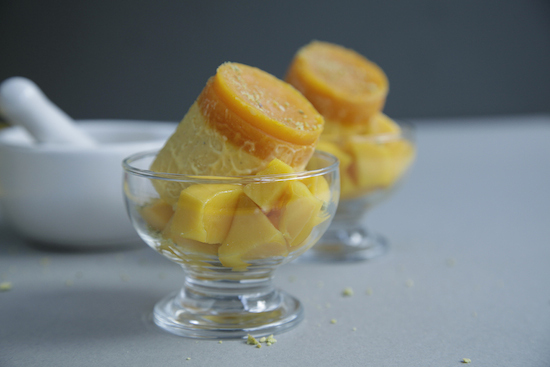 Thanks for sharing this Mango kulfi in Easy way and i will surely try to make this recipe at Home. HI! I live in the States and am dying to make this. Since our ingredients occasionally go by different names, would you please specify whether the condensed milk is sweetened or not? Thanks a bunch. This looks incredible.